In 1916, the Lake Washington Ship Canal in Seattle, Washington, was completed, connecting the fresh water Lake Washington to the salt water Puget Sound. The canal project lowered Lake Washington’s water level by over eight feet, and caused more than 1,000 acres of wetlands, the Black River, and the Cedar River, which drained Lake Washington, to run dry. (1) To control the flow of water between Lake Washington and the Puget Sound, the Hiram M. Chittenden Locks—more commonly referred to as the “Ballard Locks”—were opened at the same time as the canal to regulate the movement of fresh and salt water between the two water bodies. Prior to the digging and channelling of the Ship Canal, water would exit Lake Washington via the Black River, which flowed from its southern end into the Duwamish River, an important spawning route for salmon and a cultural lifeline for the Duwamish people indigenous to the area. The opening of the Ship Canal and the construction of the Ballard Locks became a symbol of Seattle’s modernization through the control of water. The careful choreography of control not only fixed the flow of the water around the Ballard Locks, but also transformed the Duwamish River, ten miles to the south, and with it the Duwamish themselves. 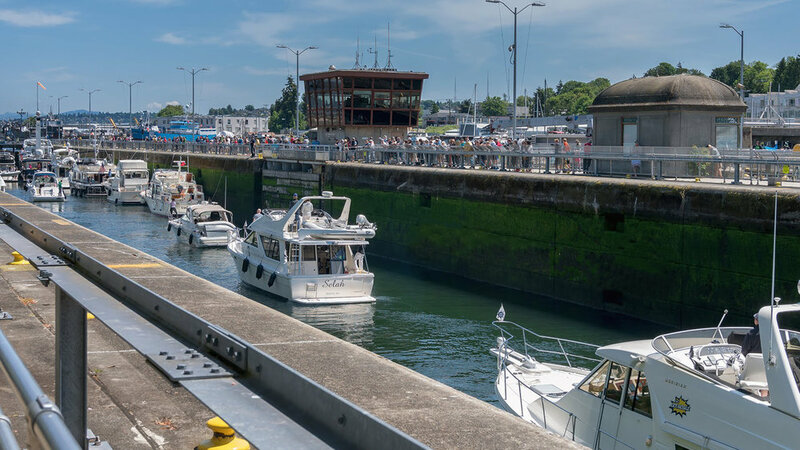 A century later, the complexity of the Ship Canal and the Ballard Locks continues to produce a cyborg human-water-animal urban space, continuously remaking the urban landscape beyond the hydrological boundaries of each site. Ten miles from each other, narratives of performance, care, and infrastructure have diverged at the Ballard Locks and the Duwamish River. 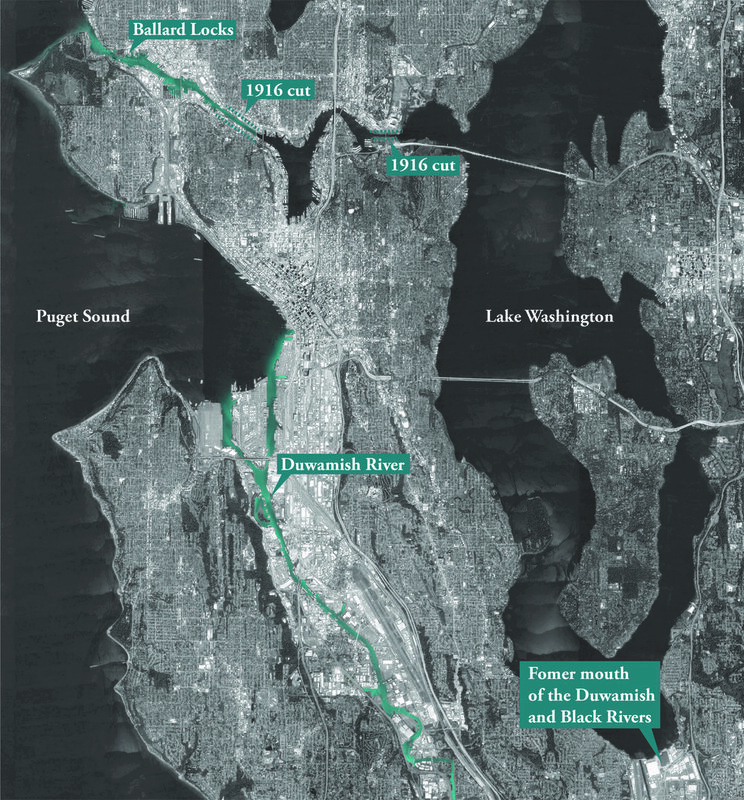 Today, the Duwamish River empties the Green River into Puget Sound south of the Ballard Locks at Harbour Island, a constructed infrastructural landscape that is home to Seattle’s international port. The neighbourhoods around the Duwamish are some of Seattle’s poorest. To the north, the Ballard Locks control the flow of water between Lake Washington and Puget Sound. The Duwamish River and the Ballard Locks no longer drain a shared inland water body, but they are linked by relational and cyborg entanglements of history, place, and nature. The Ballard Locks’ infrastructural engagement with the Duwamish people through the movement and control of water has produced a space of neither human nor nonhuman nature. Donna Haraway’s metaphor of the cyborg has come to represent the hybridity of the indefinable and in-between, the co-constitution of the human and nonhuman. (5) The cyborg metaphor builds on the idea of feminist situated knowledges—that objective knowledge is always partially obscured by our own literal and metaphorical position—to consider how different forms of life—human and nonhuman—are always in a process of constant remaking. (6) Considering sites such as the Ballard Locks and Duwamish River as cyborg spaces produced through particular historical entanglements opens new possibilities for conceptualizing what is characterized as urban or natural, human or nonhuman. This hybridity is useful for reading and designing infrastructural urban landscapes, which have always, to some extent, been cyborg landscapes. While Haraway first used the cyborg as a political and feminist manifesto to counter the objective boundaries of modern science, it continues to be adopted by a range of disciplines to reject normative binaries. Elizabeth Meyer has used “cyborg landscapes” within landscape architecture to describe the ways landscape operates between, through, and without human binaries of art and nature. (7) Following post-structural art movements of the late twentieth century, Meyer extended Haraway’s cyborg metaphor to describe landscapes as hybrid spaces operating between dualistic discourses of culture/nature, man/women, rural/urban, landscape/architecture. That is, landscape is always and simultaneously being culturally produced and materially experienced. It is always cyborg. Image 2 / Boats are carried through the Ballard Locks while salmon climb the adjacent fish ladder to the freshwater of Salmon Bay. Image by Gummi Ibsen. Image 3 / Boats are carried through the Ballard Locks while salmon climb the adjacent fish ladder to the freshwater of Salmon Bay. Image by Nicky Bloom. Watching boats and salmon pass through the Ballard Locks is a popular attraction. Tourists and locals gather at the Locks to watch water defy gravity. Standing above the water, it appears to lower ten, fifteen, and then twenty feet below the canal level. On sunny summer days, private boats wait in line to be carried down into the Puget Sound. In the fall and winter, the Locks welcome back from Alaska the fishing boats that call Seattle home. As these boats enter the fresh water Salmon Bay, their hulls full of frozen, wild Alaskan salmon, the water adjacent to the Ballard Locks is also swarming with salmon. Once cut off from entering Salmon Bay and Lake Washington because of the Locks, sockeye salmon now use a fish ladder to return to their spawning grounds. 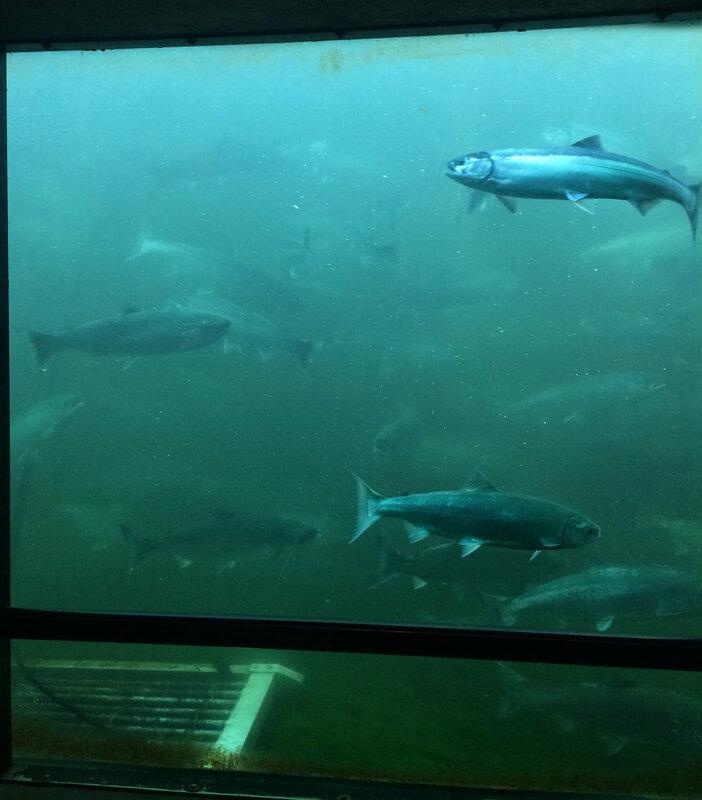 The fish ladder can be viewed from an underwater window accessible from the Locks. The cyborg continues to be taken up in landscape architecture through the language of hybridity, largely to describe the ways ecological principles can ameliorate or catalyse new landscape processes through synthetic technologies. Yet, these proposals are often filtered through normative scientific readings that describe human-designed ecological systems as self-operating in urban landscapes. Descriptions of these urban landscapes—spontaneous vegetation along abandoned rail lines, novel grass species among polluted marsh waters, emerging bird habitats atop landfills—lack a relational analysis that considers how urban environmental systems and the politics of infrastructure development are marked by largely unseen dimensions of the human experience. (8) These human experiences of nature, or political ecologies, reveal that the emergence of supposedly novel ecosystem change is the result of interrelated socio-ecological process. Because of a lack of political context, cyborgs in design have tended to appear when the focus is on speculation; the cyborg is employed as a metaphor for alternative landscape futures rather than a force already acting with and present in urban infrastructural landscapes. Misreading the cyborg landscape as a futuristic speculation or an imagined technology does unintentional political work counter to Haraway’s manifesto: it fails to distinguish the ways human and nonhuman ecologies catalyse and coalesce through historical, social, and material relations. The focus on the futurity of ecology reduces the cyborg to a technocratic agent, in play with, but distinctly different from, human life. The cyborg, along with feminist ideas of care and relationality, provides a political position for guiding human responses to urban environmental change. Feminist care ethics are brought about by embodied and engaged contact with others, and these types of interactions can engender attitudes of stewardship and belonging that offer an alternative to cyborg landscapes interpreted only as technocratic problem solvers. This position suggests how reframing human and nonhuman narratives as co-produced can create material spaces that reflect more inclusive histories grounded in compassioned stewardship, rather than nature as an instrument of productivity and functionality. The cyborg is always grounded in plurality: the flow of water that slowly decays the wooden locks built to fix the flow of water in place, or naming the channelized and polluted portion of the Green River after the Indigenous people erased through the same process of channelization. Every opening and closing, capture and release, of the Ballard Locks represents a remaking of the cyborg through the fresh and salt water, the fish, and the onlooking visitors. Simultaneously the Locks themselves are also being remade through the flow of the water, the erosion of wood, and the jumping of salmon. Throughout, humans remain active in the cyborg remaking. The cyborg landscape is not about futurity, but instead how nature has been produced through human and nonhuman forces, and how, in the case of the Ballard Locks and Duwamish River, these hybrid natures continue to collide with colonial histories, positivist engineering, and capitalist ontologies to continuously remake urban landscapes. The remaking of Indigenous lifeways through settler-colonial landscapes, the protection of salmon while linked waterways remain polluted and under-regulated, and the restoration of riparian habitat through geoengineering rather than the restoration of human habitat through decolonizing, illustrate the continuously unfolding, interwoven, and often unexplainable abundance of meaning found in cyborg landscapes. With this abundance of meaning, the plurality of humanness and non-humanness that defines the cyborg becomes a methodology for organizing responsibility in environmentally degraded landscapes with histories of oppression, such as the Duwamish River. The ecological restoration, industrial economy, and recreation of the Ballard Locks, for example, suggests how an urban infrastructural landscape can be simultaneously engaged in multiple narratives of care that privilege neither objective human technologies nor the agency of the nonhuman world. Image 5 / The new restoration site constructed by Boeing will vastly expand the amount of suitable habitat for salmon on the Duwamish River. Photograph by the National Oceanic and Atmospheric Administration. Care along the Duwamish River is visibly different from the Ballard Locks. Restoration projects, while not attempting to restore an image of picturesque nature, seem to accept decay as the outcome, at times mimicking the visual forms of abandonment. 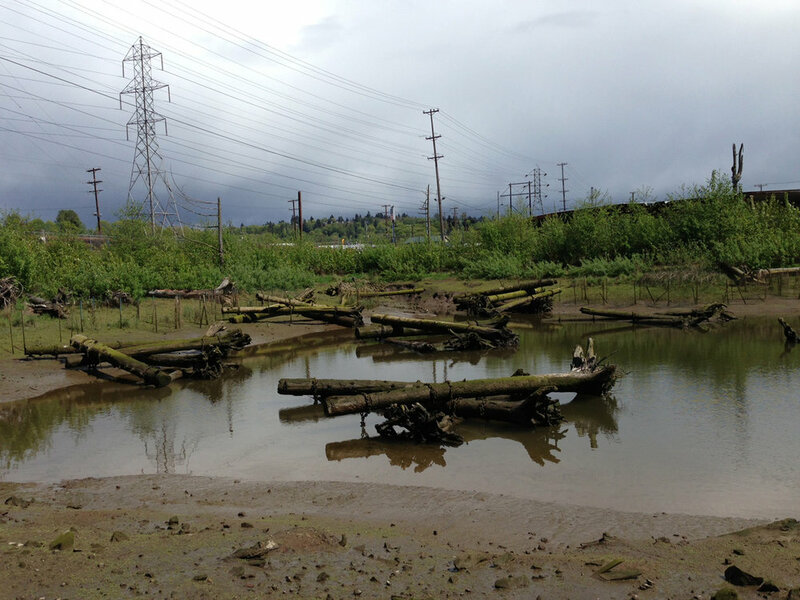 An openness to the multiplicity of natural beauty is complicated in the case of the Duwamish, where a landscape has been deemed a waste site because of the systemic displacement of other forms of natural beauty. Images of the Duwamish seem to accept the visual form that decay takes while allowing the river to be perceived as beautiful in a new way. But this gaze still fails to consider how time, culture, and economy have shaped what is seen. Similarly, ecological restoration has improved the salmon habitat along the Duwamish, but efforts by the Environmental Protection Agency and National Oceanic and Atmospheric Administration seem to only be remaking the forms of material waste that currently populate the Duwamish rather than using the restoration to imagine a different future for the river, one that could include new forms of human and nonhuman entanglements. The Ballard Locks and Duwamish River illustrate how cyborg landscapes exist as everyday infrastructures, continuously becoming through historical and present-day processes. As the Ballard Locks become intertwined with the Duwamish through multiple structures, subjects, knowledges, and exercises of power, their relationality suggests how spaces, subjects, and processes are constantly grounded and transformed through socio-spatial processes. (11) When the cyborg is understood as a historical process of hybridity, rather than a future fix-all, dominant narratives of nature as pristine and disposable become complicated; in a cyborg landscape, contaminated soil and water could be leveraged to negotiate relationships of human with human, nonhuman with nonhuman, and human with nonhuman, decentring the role of humans while still maintaining the need for human responsibility and care. For this reason, the cyborg suggests how design can be a political practice that cracks open the plurality of life to suggest new types of care through the discovery of more-than-human world makings. (1) Matthew W. Klingle, Emerald City: An Environmental History of Seattle (New Haven: Yale University Press, 2007), 71–72. (3) "Lower Duwamish Waterway Superfund Site," Envirionmental Protection Agency, 2017, accessed December 10, 2017. https://cumulis.epa.gov/supercpad/cursites/csitinfo.cfm?id=1002020. (4) Lynda Mapes, "Water’s natural rhythms nourished our area’s native culture. Then came the Ballard Locks," The Seattle Times (Seattle, Washington), June 30, 2017. (5) Donna Haraway, A Cyborg Manifesto: Science, Technology, and Socialist-feminism in the Late Twentieth Century, Manifestly Haraway (Minneapolis, London. : University of Minnesota Press, 2016). (6) Donna Haraway, "Situated Knowledges: The Science Question in Feminism and the Privilege of Partial Perspective," Feminist Studies 14, no. 3 (1988): 575–599. (7) Elizabeth Meyer, "The Expanded Field of Landscape Architecture," in Ecological Design and Planning, ed. G.F. Thompson and F.R. Steiner (New York: John Wiley, 1997), 70–76. (8) Matthew Gandy, "From urban ecology to ecological urbanism: an ambiguous trajectory," Area 47, no. 4 (2015): 150–154; Elizabeth Meyer, "Sustaining beauty. The performance of appearance," Journal of Landscape Architecture 3, no. 1 (2008): 6–23; Sean Burkholder, "Designing dredge: engaging the sediment landscapes of the Great Lakes Basin," Journal of Landscape Architecture 11, no. 1 (2016): 6–17. (10) Janet Tu, "Duwamish Tribe denied federal recognition," The Seattle Times (Seattle, Washington), July 3, 2015. (11) Sarah Elwood, Victoria Lawson, and Eric Sheppard, "Geographical relational poverty studies," Progress in Human Geography 41, no. 6 (2017): 745–765. (12) Donna Haraway, Staying with the trouble: making kin in the Chthulucene (Durham: Duke University Press, 2016), 4. Sara Jacobs is a landscape designer, scholar, and educator. Her research draws on environmental history, political ecology, and visual representation to explore the multiple ways landscape and site define the urban built environment. Sara is currently a PhD candidate at the University of Washington, and has degrees in landscape architecture and architecture from Harvard University and the University of California, Berkeley.